In 1955 a group of Baptists responded to the need for a church on what was then the western edge of Rocky Mount. On June 5, 1955, Lakeside Baptist Church was constituted. Though we are Baptist in heritage and tradition, over the years in our worship and practice, Lakeside has moved beyond the label of a denomination to incorporate the richness of other Christian traditions. While we retain the Baptist name, in our city we are known simply as Lakeside Church. Our congregation is distinguished by its ecumenical spirit, the dignity and classic style of our worship, the attractiveness of our facilities, and the community involvement of both our programs and our members. Denominationally, the background of our church is varied. We practice what is referred to as "open membership," meaning that non-Baptists do not have to be "re-baptized" to be a part of our congregation. In recent years, at least 60 percent of the persons joining our church by transfer of membership have come from traditions other than Baptist. 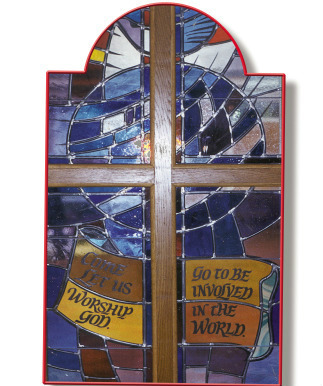 The emphasis of Lakeside's congregational life is on worship and involvement in community and social ministry. By Baptist standards, our worship would be characterized as formal: in our worship, the Christian year is followed; the clergy are robed; the choir processes; and the liturgy is crafted to engender a great amount of congregational participation. No evening service is held, although youth and children’s choirs and activities, board and committee meetings, and fellowship suppers are held on Sunday evenings. Lakeside is involved in numerous community ministries. Meals on Wheels for the Rocky Mount area was, for many years, headquartered here before moving its office and distribution to First Presbyterian Church. The Rocky Mount office of CareNet Counseling utilizes space in our facilities, providing two days of counseling per week. Lakeside was the motivational force for the local Habitat for Humanity affiliate and the church built its first Habitat house in 1996. 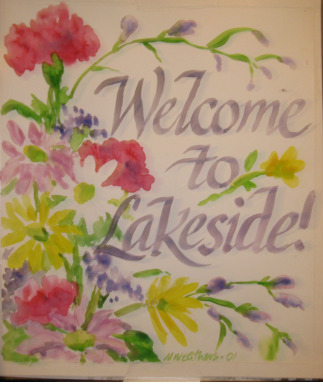 In 2005, as part of its 50th Anniversary celebration, Lakeside partnered with West Haven and First Presbyterian Churches to build another house. We also joined many other congregations in the community in providing housing for persons who relocated here following Hurricane Katrina. Since 1991, Gatekeepers Workcamp has involved our young people in the refurbishing of homes owned by elderly and disabled residents. On the first Saturday in November of each year, we host “Lakeside Involved,” a day of ministry to the community that normally involves over 150 people working on 12-15 projects. We are also a member congregation of United Community Ministries, an ecumenical social ministry that provides shelter for homeless persons, food and emergency assistance to families, and job training and counseling for individuals. We participated in the Interfaith Hospitality Network and housed homeless families in our facilities four to six times a year and now support the Bassett Center which provides services for homeless families. We also support the FIGS program (Filling In the GapS) which provides financial assistance in crisis situations. At its founding Lakeside was affiliated with the Southern Baptist Convention and the Baptist State Convention of North Carolina. Because of the national convention's turn toward fundamentalism, the congregation removed itself from affiliation with the SBC in 2000 and with the Baptist State Convention of North Carolina in 2006. We support both the Cooperative Baptist Fellowship and the Alliance of Baptists which are moderate, forward looking missions and service organizations. Lakeside has approximately 550 resident members and a budget of over $646,000. We have 270 family units. Our physical facilities are attractive and well maintained. The church houses Lakeside Preschool, a week day program for two, three, and four year olds using traditional and Montessori methods. In the administration of our church, both men and women serve as deacons. We would ordain both men and women to ministry as requested. During our 63-year history, our church has been served by only three pastors. Rev. Clarence Godwin was pastor from 1955-1965. Dr. Gaylord Lehman came to Lakeside in 1966 and served the church for thirty-two years. Dr. Jody Wright, the current Senior Minister of Lakeside, began his ministry in August, 1998. Lakeside is served by two boards which share in the lay administration of the church. Diaconate: The Deacons guide the spiritual life of the church, recommend and determine matters of policy, give direction to the church's ministry and professional staff, and assist in the care of the families of the congregation. The Deacons are also required to approve the annual budget after it has been prepared by the Board of Finance. The Diaconate consists of fifteen members who serve three-year terms. Each year a special Deacon Nominating Committee selects five nominees who are elected by ballot vote. The Diaconate meets the third Sunday of every month. Board of Finance: The Board of Finance has general supervision of the financial and business life of the church. It prepares the annual budget, submits that budget to the Diaconate, and both boards jointly recommend it to the church. The Board of Finance is responsible for all fiscal operations and approves all special offerings except those annually received as a part of church life. The Board of Finance consists of fifteen members who serve three-year terms and by several chairs of other committees. Members are selected by the Nominating Committee and elected with all other church officers and committees.